We're off to the airport shortly to catch our Mediterranean Cruise on the Queen Elizabeth ship. We have taken measures against pickpockets, but on the chance that we do have a problem, I took the opportunity to take out all kinds of "unnecessary for travel" cards from my wallet. Whew, now that feels much lighter. First stop (after a flight connection in Toronto of course) Venice, Italy for a few days. I was already planning to send a little gift to my Aunt in Quebec City. 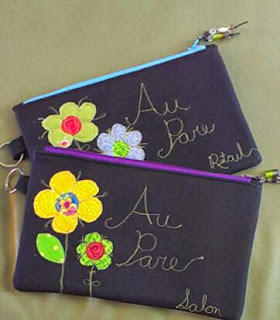 I will send either a little pouch or a daisy sewing kit. 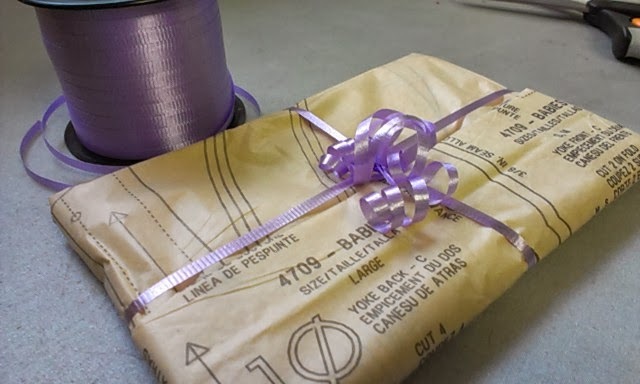 After receiving my little unexpected gift from my daughter the other day, so smartly wrapped, I decided to take a tissue sheet from an old pattern and wrap my aunt's little gift the same way. Yep, I like it. 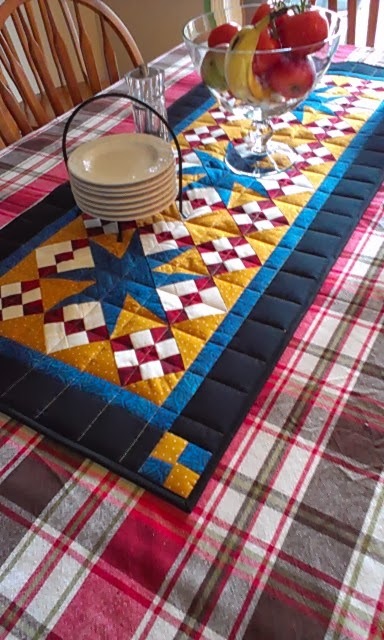 And I think my long time sewing aunt will like it too. My brother in law will be stopping in to see her next week and I'll send it along with him. She will be surprised. Don't you think that an un-expected gift is the best kind? Yesterday I went to my daughter's salon to get my going-away haircut. She gave me this little gift that she bought for me off Etsy. 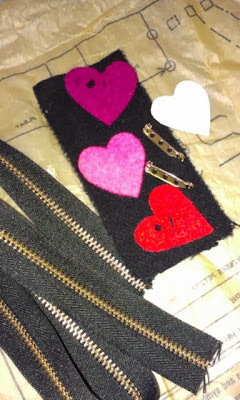 I had been looking to buy this diy zipper brooch kit earlier in the summer because I wanted to try the craft. Well, summer activities, and fall painting projects got in the way and I pushed this project out for a later time. Now that I have my little brooch kit, this will be one of the first little projects I try when I get home from my trip. I think these brooches will be awesome to make for a craft sale. The kit came packed in tissue from an old pattern and with a nice note card from the vendor. I loved that presentation. I may do that next time I give a little gift to a sewer. Thanks Pare. You made my day!! 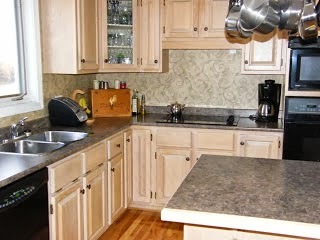 This kitchen picture was taken in 2007 when we had the counter tops changed. I recall being so pleased. I look at it now, and I say to myself, "what was I thinking?" 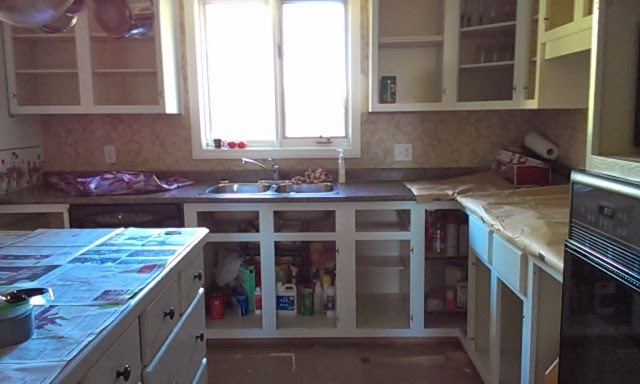 After - Cabinets are Antique White. 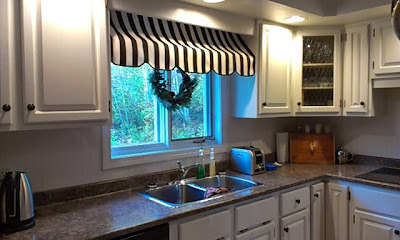 I love my little awning. Here are some details and a few pictures that I took along the way. We took a slow pace to do the project. A month. Each Monday, we started a new phase and would work hard for two or three days, then clean up and take a break. 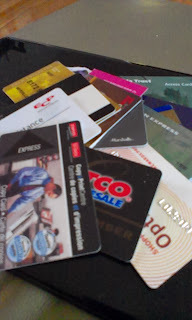 Then we would visit the hardware store to buy supplies for the next phase. 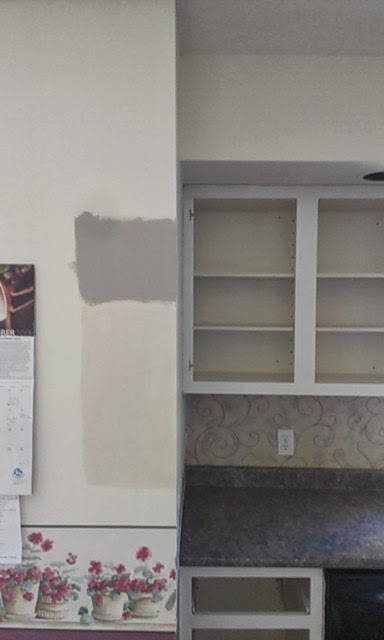 Some will asked what cabinet paint we used. 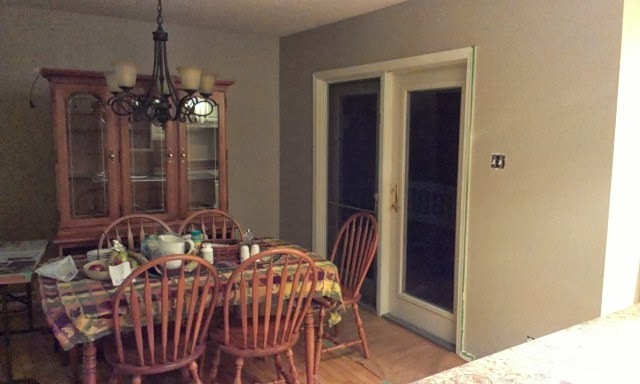 We chose Beauti-tone cabinet and kitchen paint with the help of our local Home Hardware paint specialist. It was one of the premium paints that had a primer in it. Before we even started to paint, we had a days worth of preparation work to do. After removing the doors and hardware, we cleaned all the cupboards and frame with TSP. Then, we did a light hand sanding of everything. We used tack cloth to wipe up the dust. We applied painters tape on the walls around the cabinets, covered my wood floors and took a deep breath. Then after all that we painted. Two coats. The doors took the longest because they have a front and a back. The frames went pretty quick. 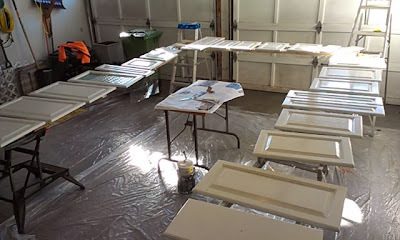 Our garage turned into a cabinet door painting studio. It worked great! This is half of our cupboard doors. 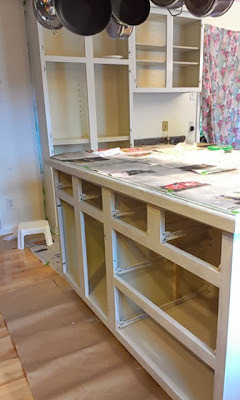 Week 1 - Phase I - Painting the Pantry and Island frame. The doors are in the garage drying. Week III - Auditioning dining room wall colors. We chose a color in between these two shades of grey. Week III - Phase III - Wallpaper gone, priming walls done. We paint the next day. Phase III - two coats of wall color done. The green painters tape is still up. This was our most tiring day. Two coats in one day might have too much for us. Phase III. 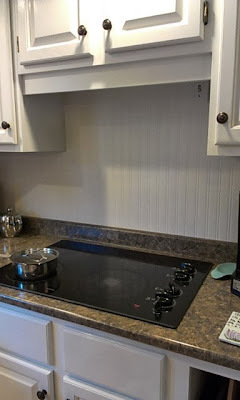 and a half - New bead board back splash wallpaper. I have not been in my sewing room for three or four weeks now. 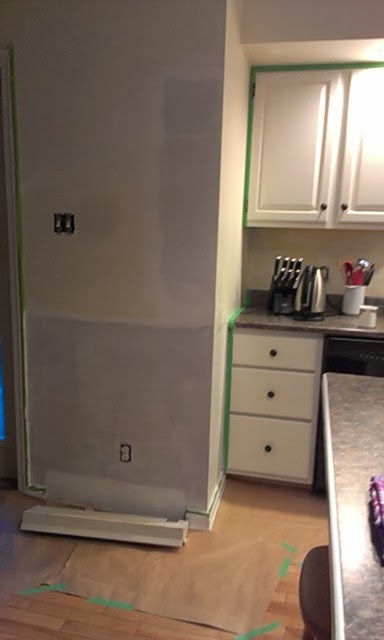 I was totally into painting the kitchen. The kitchen is now almost done, and I'm my mind is slowly drifting back to thinking about sewing projects. 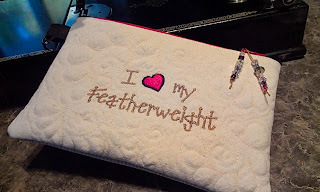 I wanted to sew something today. But not something big. This runner was the first UFO that I came across that seemed doable.... Not having the brain power to figure out a free motion design, I thought I would do simple straight line machine quilting. And you know, I kinda like it. And I got a chance to use my new clover clips that I bought last month. This is the first time I'm actually using them for binding. They work great except for the corners. 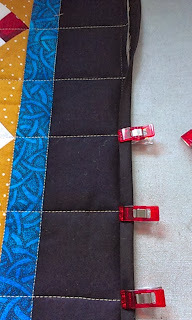 A good old fashion straight pin is still good for those delicate small places that need to be held in place right up to the last stitch. 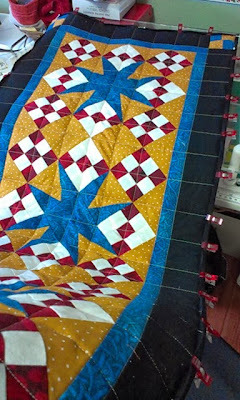 Ahh, that felt good...I am happy to get back into my sewing room. And I'm happy to finish this long overdue UFO. The runner is done and it doesn't quite go with my tablecloth here, but it will be nice with a plain colored cloth. Or maybe it would look nicer on one of my kids tables. We are leaving on vacation later next week, so this coming week will be filled with decisions on what to pack for European weather and last minute errands related to travel. My friend Valerie M. is having a milestone birthday today. She has friends and family from all over the world coming to visit. She is so excited to see people she hasn't seen in years. The invitation to her do-drop-in today, said no gifts. 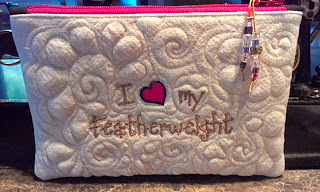 But I think she won't mind a little handmade thing, made with her in mind. She was here for visit a couple of weeks ago. We were doing a little work on her Singer Featherweight and so I know she'll love this little bag to put some of her special feet and featherweight notions. 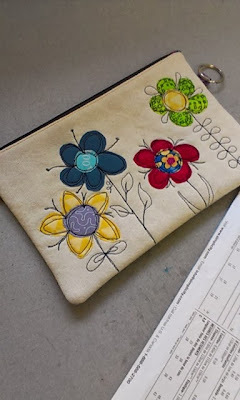 Again, this is a simple pencil case pattern ... Cute eh! 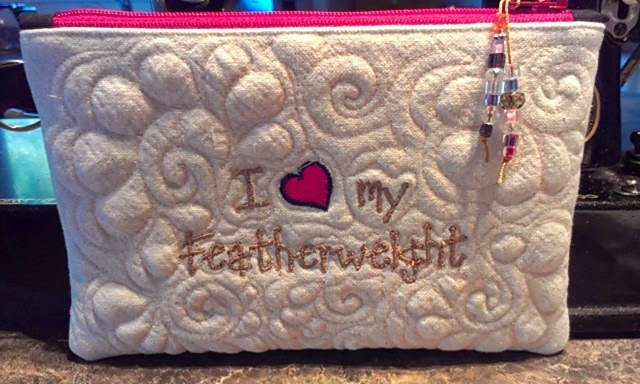 My daughter needs money bags for managing the money at her new salon in old Saint John, NB. The name of her salon is Au Pare. Won't she be the cute one walking to the bank every day with these special personalized money bags. It's just a pencil case pattern, but it's a perfect size for currency and such. I've given myself a day off between painting the kitchen cabinets and moving on to the walls. I am loving spending a bit of time in my sewing room. It's a mess, but I thought I'd get this little project for Grace done. I'm not sure why, but she wants an old fashion poodle skirt. Maybe it's for Halloween. I bought the fabric and wide waistband elastic last week and already had the pink and white felt. I made a simple circle skirt. It was simple to do, except the part where I was trying to determine how big to cut the hole for waist. 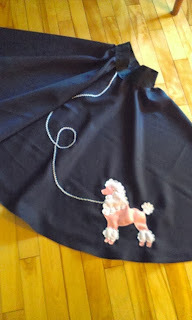 I used my narrow hem foot to do a quick and professional hem on the skirt. Then I zig zagged on the waistband. 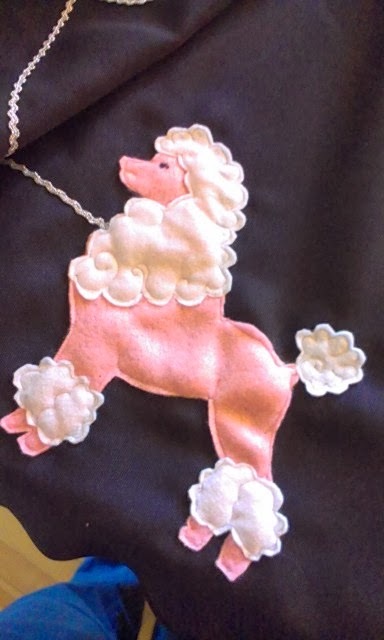 Cutting out the poodle was easy.... I then free motioned it on the skirt, and stitched on a bit of trim for the leash. Cute, eh. Edit: And here she is doing a twirl.. 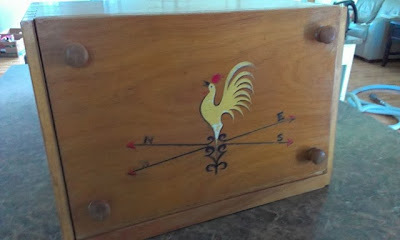 I've had this breadbox since I was a young married woman. It's from the 1950's. I think it came from my father;s mother's house, but I can't be sure. I use it every day, and I can't imagine living without it. I checked the internet, and it is vintage, but it's not that valuable. I've been painting the kitchen, and have been wrestling with myself over the question..... Should I sand and paint this or not? I'm planning on painting the two stools at my island an accent color like red or brown. But I feel I need something else red too. I know... I'll ask my sister and see what she says.